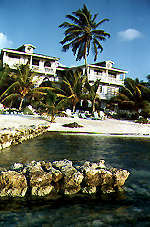 Tropical beauty, hospitality, and comfort are the words that come to mind when describing Rock's Inn. From the moment you step off the airplane, the friendly staff of Rock's Inn will see to your every vacation need and be quietly at hand to ensure that your holiday is perfect, the way you want it to be. No need to worry about arranging diving, fishing, snorkeling, sailing, golf cart rentals, inland tours to ruins and other activities, just ask and it will be done. Or just relax on our beach and enjoy a cool drink from nearby bars, which there are a couple just a few steps away from our property. Even a personalized shopping trip to the "super" market to stock your kitchen is included as a service to our guests. We also reconfirm your return flights at no extra charge. 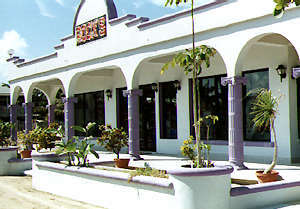 Rock's Inn was built in 1989. 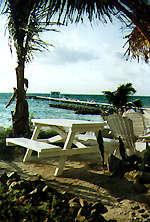 It is owned and operated by the Salazar family, natives of Ambergris Caye. 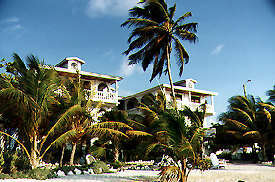 The fourteen rooms - all efficiencies - are located on the Caribbean shore- just two quiet blocks north of downtown San Pedro. 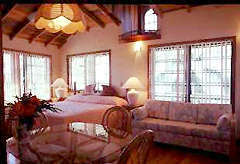 All rooms are air-conditioned (at no extra charge) and all have completely equipped kitchens. Our rooms are decorated in soft tropical colours which compliment beautifully the selected Belizean hardwoods used in the furnishing and cabinets and in the floors and ceilings of the third floor rooms. (Our third floor rooms also have jacuzzi tubs.) You're certain to enjoy a great night's rest on our high quality mattresses and linens. All our suites are spacious, we are happy to add a bed for the children. Children under age 12 are free of charge when staying in the same room as their parents. 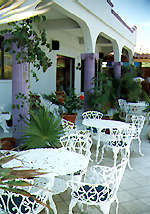 Many rooms have sea side verandas. For your enjoyment, there are nearby places that would have hobie cat and sunfish rentals available right away, and also you can climb the Party Barge for a sunset and moonlit cruises which would include drinks as well as snacks. Whatever your vacation dream plans are, Rock's Inn can help make them come true - reef, rainforest, ruins, relaxing - if we don't know about it, it doesn't exist. Each unit is air-conditioned (no extra charge) with a fully furnished and equipped kitchen. Each room has two ceiling fans and a private bathroom. These rates INCLUDE the local ground transfers from/to the airstrip/hotel, but does not include the 7% government room tax. For every additional person over the age of twelve (12) beside the two persons staying in the efficiency there will be an extra charge of $10.00 US. 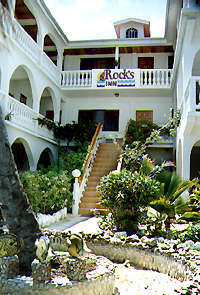 Rock's Inn accepts VISA, MasterCard and American Express, traveler's cheques and cash! For your grocery needs in San Pedro, come and see us at Rock's Grocery. Now with two locations, downtown and on the south side. Food, drinks, paper products, we are a full service grocery store! For your dining pleasure, El Patio offers delicious lunch and dinner treats. With several daily specials and an excellent menu, El Patio can take care of all your dining needs. Click here to see our menu... Remember, it's in Belizean dollars, 2 per one US dollar.